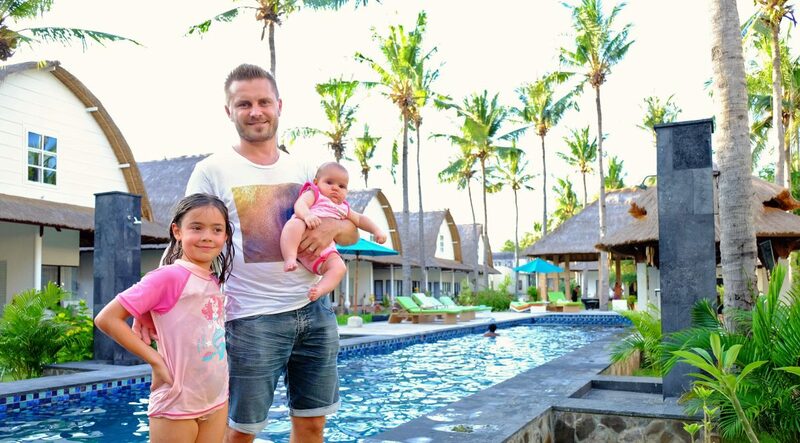 The moment we arrived at Ocean Jambuluwuk Resort, we immediately knew that we would have plenty of good times! Beach-front restaurant, massive pool for both adults and kids to play in and something totally unexpected… it seemed like we arrived at some kind of African safari-like place! 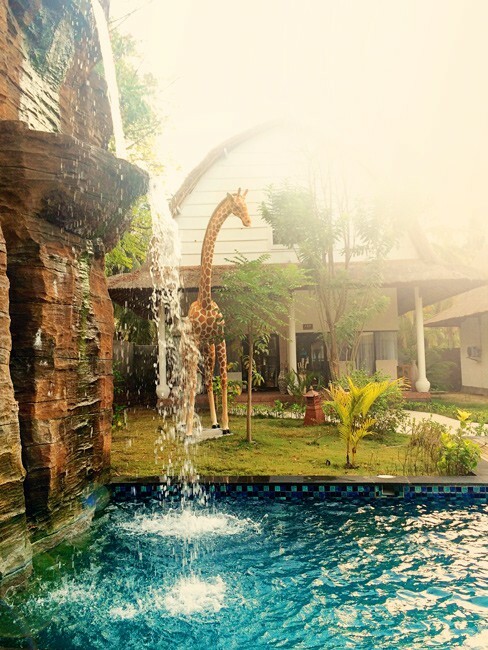 All around the resort we found scattered statues of Tigers, Giraffes, Elephants and so much more! To top it off the building right next to the pool had been created into the shape of a ship! Now, tell me that is not cool! Our kids eyes lit up as they were planning where to play first! 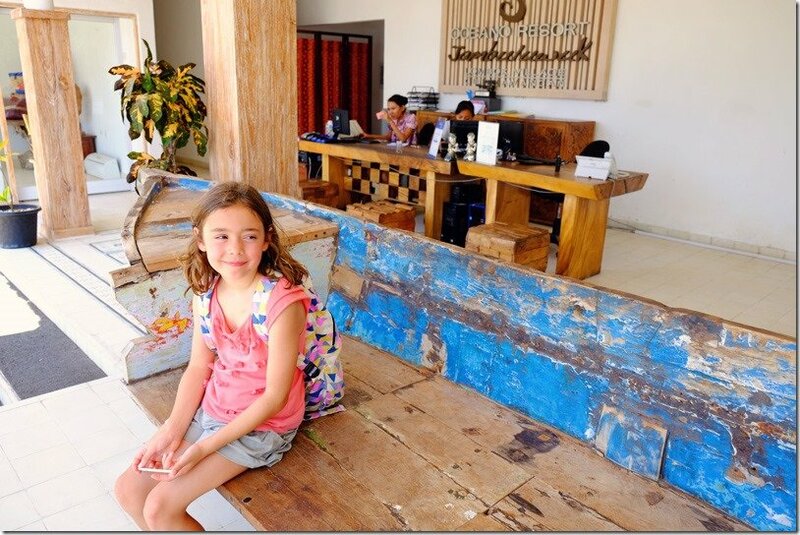 Yes, we arrived to the best Gili Island accommodation and the coolest family resort on the island! Gili Islands are spectacular in their untouched beauty. No cars will make a sound, there are no scooters and the only transportation on the island is the funky horse cart! Are you already on your way to Gili Trawangan Island? 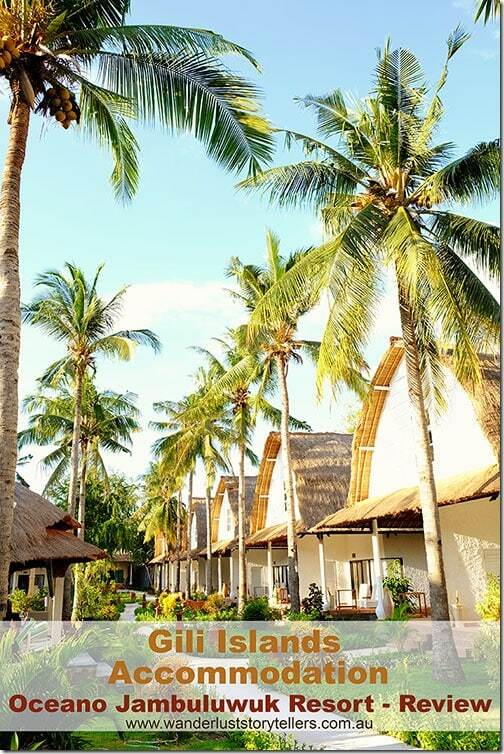 Passport ready and all you need is the best place to stay in Gili? Well, scroll down, read our review, check out the photos and click for more details in the booking information. 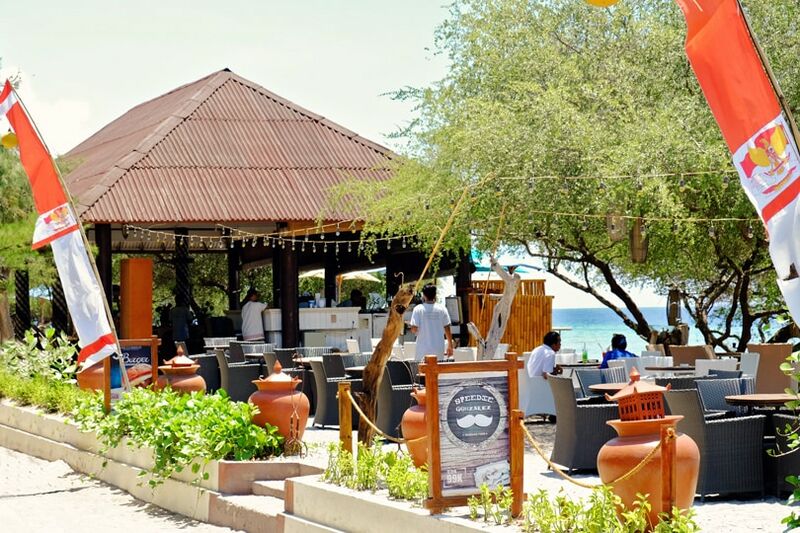 Location: Oceano Jambuluwuk Resort is only a 10 minute horse carriage ride away from the Gili Trawangan Port. 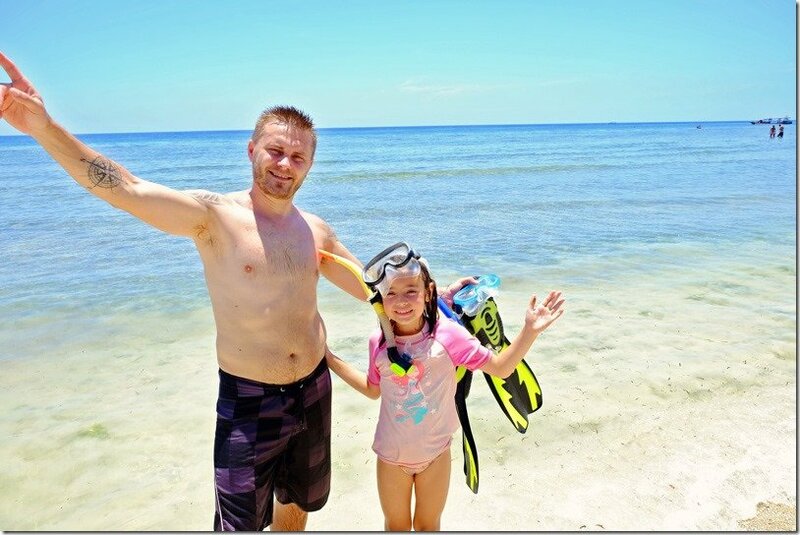 Getting to Gili Trawangan is easy! Private speed boat will take you about 30 minute from Bangsal Harbour in Lombok to Gili T Port. Every time I write about our experiences, I smile! Writing about Oceano Jambuluwuk Resort is no different. The resort is massive and has plenty of choice of accommodation. If you are after a Deluxe Room, Private Pool Villa or a Superior Lumbung Traditional Village feel. You have got it all here. The resort is one of a kind! The unique Jewels of Jambuluwuk concept for the design of the resort can be seen everywhere. Luscious gardens hide a lot of interesting statues of African animals which give you a sense of being on a safari. Small pathways weave through between the villas and into different sections of the resort. Touches of luxury everywhere, beautiful pools with pool bars for romantic cocktails or delicious milkshakes for the little ones. 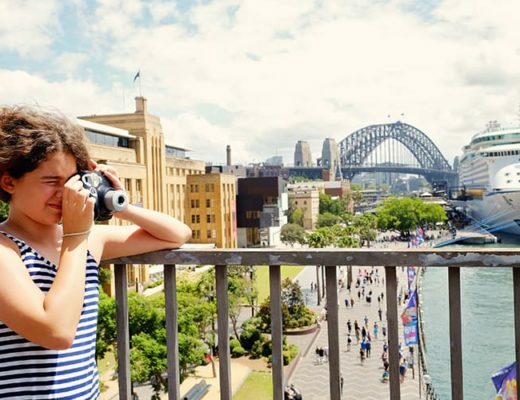 The choices of accommodation options are plenty here! If you are after a romantic getaway, there are small and private villas available for you two. 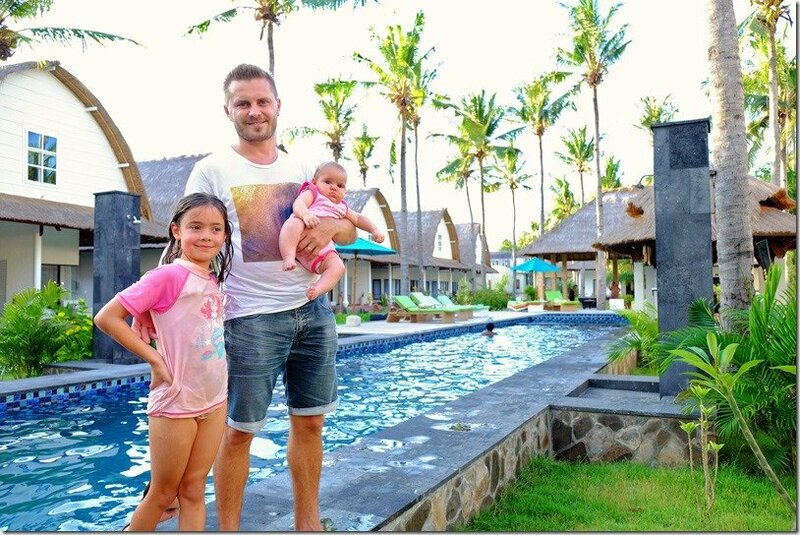 If you are travelling as a family our first pick would be the Superior Lumbung located at the rear of the resort in the Traditional Balinese Village. The spectacular looking villas are perfect for both families and couples. You can chill out on your private terrace or enjoy a swim in the relaxing palm tree shaded pool. 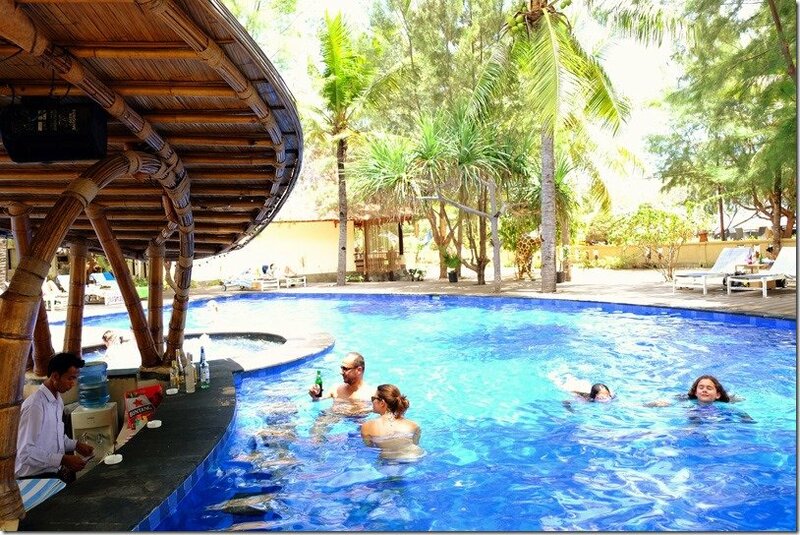 You can also indulge in some yummy specialities from the swim-up bar and order lunch from the restaurant. Perfection and in a really beautiful spot! There are other family rooms available, however we think that staying with kids in one room with beds next to each other, is perhaps a little bit to close for comfort. 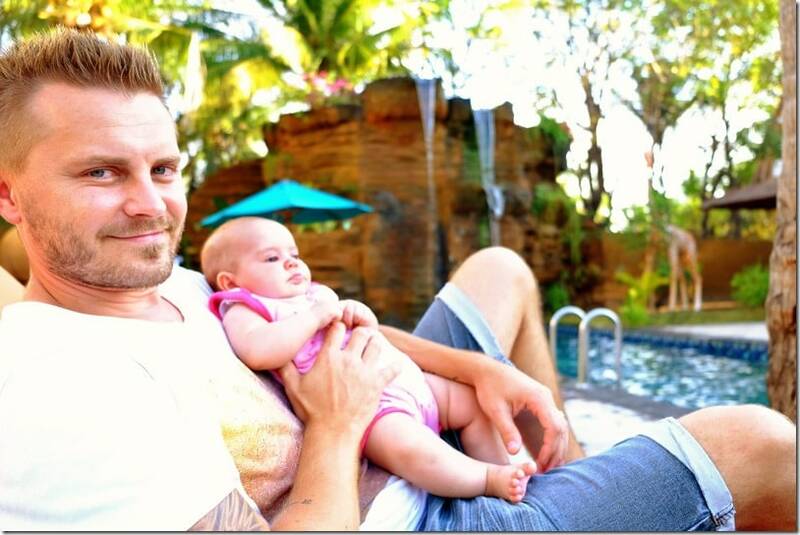 There is always an option of getting an extra single villa for your kids, as long as they can look after themselves. All villas are equipped with the usual; TV, Cable TV, Fridge and Coffee & Tea making facilities. Showers are in all the villas, however the Superior Lumbung also has a relaxing bath, for some bubble bliss. Choice of which place to stay in is of course yours. 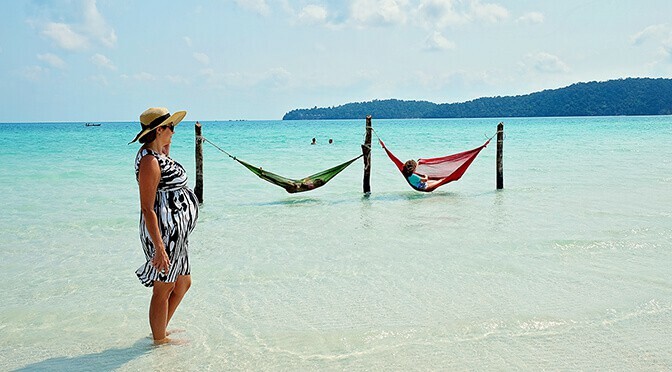 Jambuluwuk Oceano Resort is packed to the brim with things to do for both couples and families. As I mentioned before, the resort is designed with a Jewel of Jambuluwuk theme in mind. Kids can run around and spot the amazing statues of animals positioned in great garden settings. The pathways between the villas give you a sense of village life, not uniform style like a lot of the resorts are. Katie and Lily had a great time playing in the gardens, climbing on the tigers and spotting all the native African creatures. There are two major pool areas for families to unwind at. 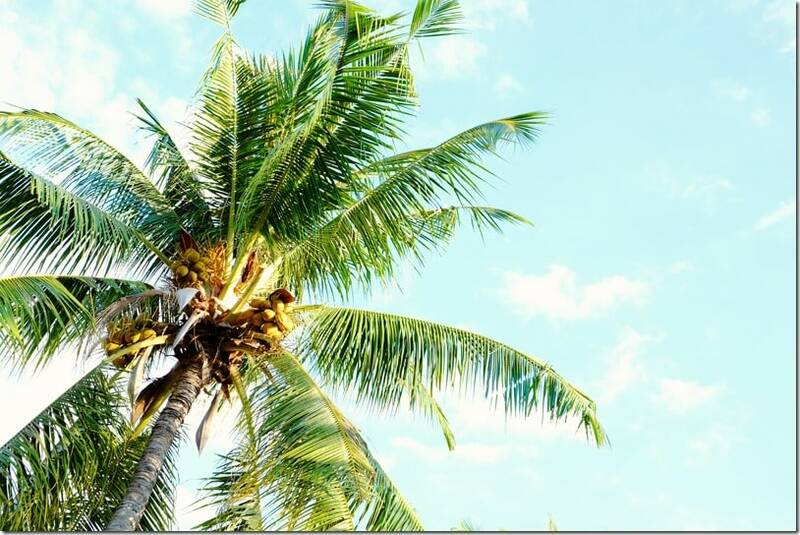 Imagine yourself on a sunbed, surrounded by the palm trees and sipping on a Pinacolada. Sounds good? Because it is! Your little ones will be more than amused in the pools swimming for hours. 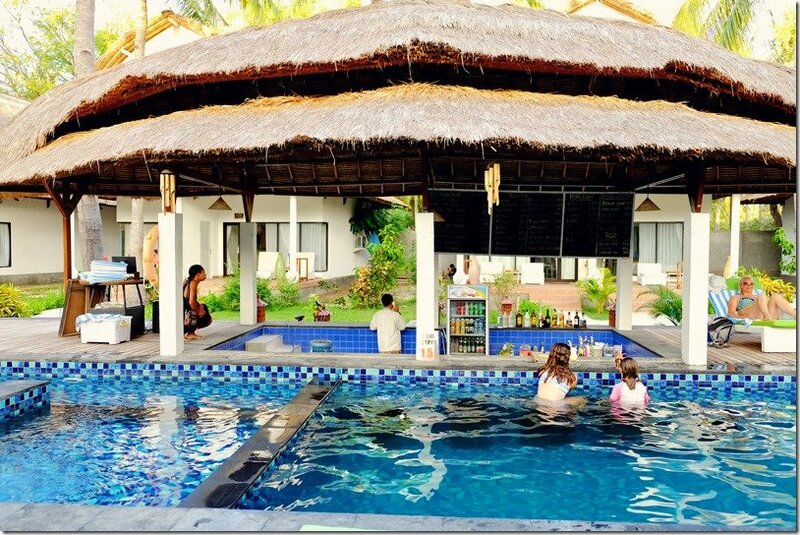 The pool swim-up bar offers not only adult drinks, but also a large selection of kid-friendly juices and milkshakes. Tip: the chocolate milkshake = YUM!! The main pool has a great setting, with a pool bar in the middle island and the shipbuilding creeping up close. Very cool! As to the second pool, it is located in the traditional village at the rear of the resort. This one is more of a classic lap pool, but still large enough for kids to entertain themselves. Yes, there is a second swim-up bar here too! 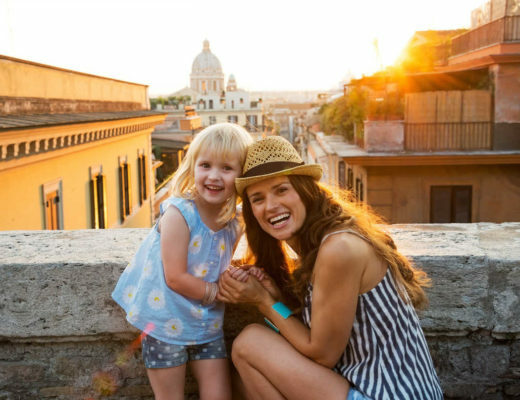 The resort has a variety of games that you and your kids can play. Front of the main pool, there is a full volleyball court. We found numerous families having fun here until the late hours of the day. There are pool tables located in two places of the resort, so the teenagers and adults can have a bit of fun as well. There are few scattered games around the place, like chess board which you can find next to the main pool as well. Now, this was our favourite! 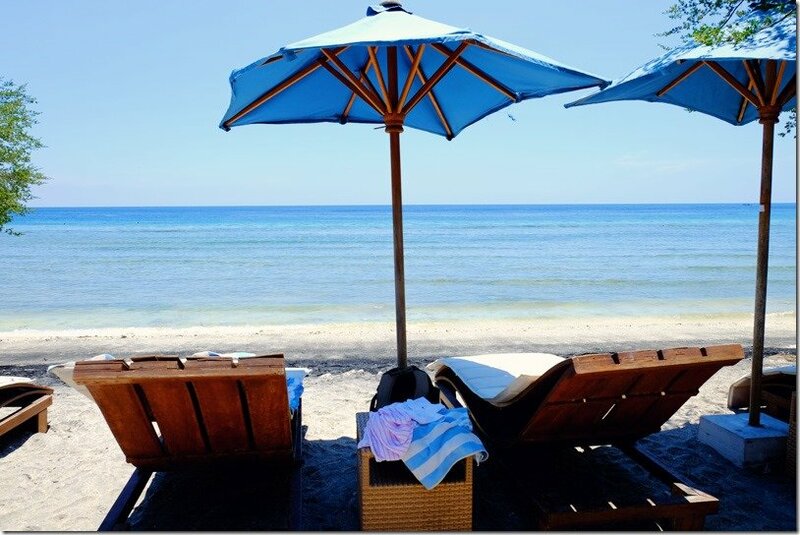 Oceano Jambuluwuk Resort has a private stretch of beach just for you to enjoy. Sunbed, warm sand and chillaxing to the max! Have you ever seen coral and hundreds of colourful fish swimming around creating a magical underwater spectacle just for you? If the answer is YES, then you know what I’m talking about. We spent hours checking out the underwater wonderland. Such a beautiful place and what a way to spend your time here. Water is crystal clear and fish is in abundance! There are only three ways to travel around Gili Trawangan. 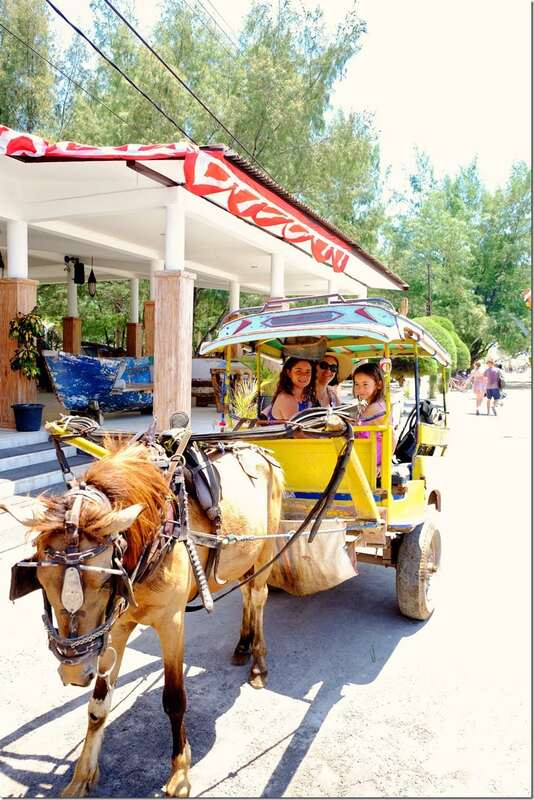 First is the horse carriage, which will cost you around 150,000.00 Rupiah one way to or from the port-side town centre. Second is on foot, which in the heat of Indonesian sun may be a quite a sweaty experience! And of course the third is the bicycle! Yup, there are thousands of bicycles on the island. Our resort has a selection of bikes for hire, both for adults and for kids. The beach-front resort restaurant has it all. An international menu will satisfy the hardest of picky eaters. I know, because I am one! We indulged in many of meals here. Both wood-fired pizzas and the Indonesian food was amazing. Drinks are delicious and service is always with a smile! We also had a two-piece band playing covers for us. Hearing some of the familiar songs in the Indonesian accent raised a few smiles, but it was a great way to spend a starry night evening. Great food, awesome company, feet in the sand and music playing. Yup! Awesome! Room service is also available if you would like to indulge in the yummy goodies on your private terrace, or in your air-conditioned room. It is totally up to you. Buffet breakfast is super delicious as well. The resort staff prepares it all to perfection and the setting is perfect! Beach views, coffee, juice, fruit, pastries, custom-made omelette and a mountain of bacon. Mmm… yes, that is what I normally eat for buffet breaky. What is your selection? Man, I love sharing my memories from travels. 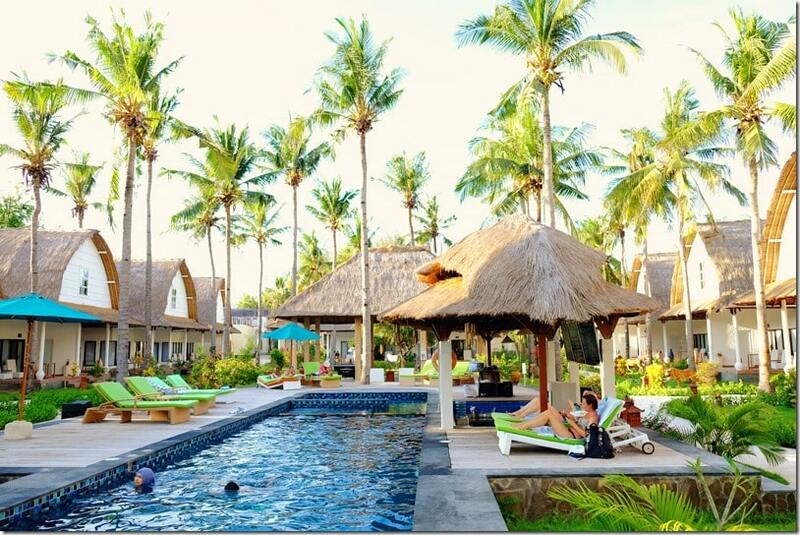 Staying at Oceano Jambuluwuk Resort was perfect, not only for what is included in the resort. Only few minutes from your villa and you find yourself sitting on some of the world famous beach swings, whilst enjoying the beauty of the extraordinary sunsets! These sunsets are on par with the best ones that I have ever seen. Colourful, beautiful and perfect! Which villa will you choose? Did the Superior Lumbung catch your eye too? Are you looking forward to snorkelling? I bet you are! you love being close to the ocean. you love relaxation and bliss. you love staying in private villas. you love yummy food and swim-up pool bars. you love sunsets and swings on the beach. Book your beautiful room or villa here! | Read their reviews on TripAdvisor here! Costs of Rooms: Rooms start from AUD $82 p/n or US $63 p/n – This includes a delicious and yummy buffet breakfast each morning as well as complimentary bottles of water daily. Where: Ocean Jambuluwuk Resort is located 10-minute horse cart ride from Gili Trawangan Port. Getting to Gili Trawangan – take a 30-minute private speedboat ride from Bangsal Harbour in Lombok to Gili T Port. * We stayed at this resort as guests of Ocean Jambuluwuk Resort. All thoughts, opinions and experiences are our own. We pride ourselves on delivering honest hotel reviews.